If two or more parties agree to the same terms and conditions about the transaction they are about to get themselves into, then this means that they have an agreement. 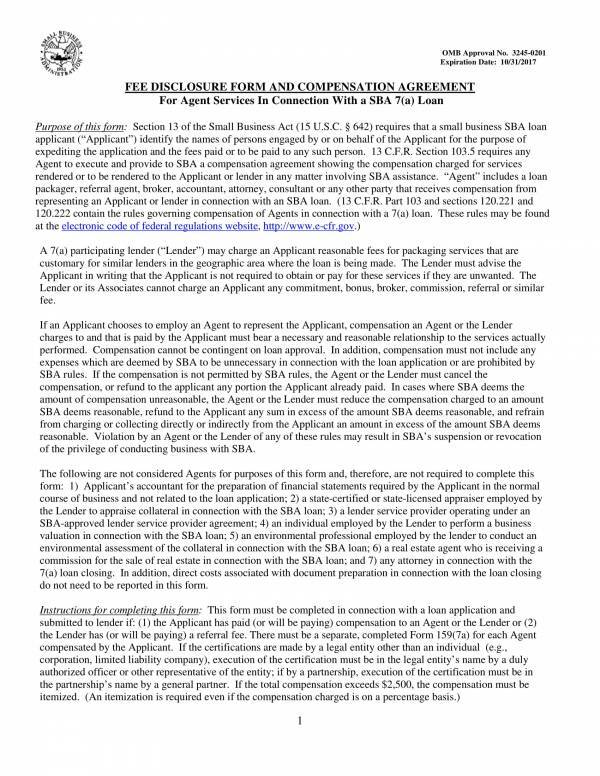 An agreement is formed basically from an offer that is being accepted. One party offers something with certain terms and conditions, while another party accepts the offer together with their given terms and conditions. 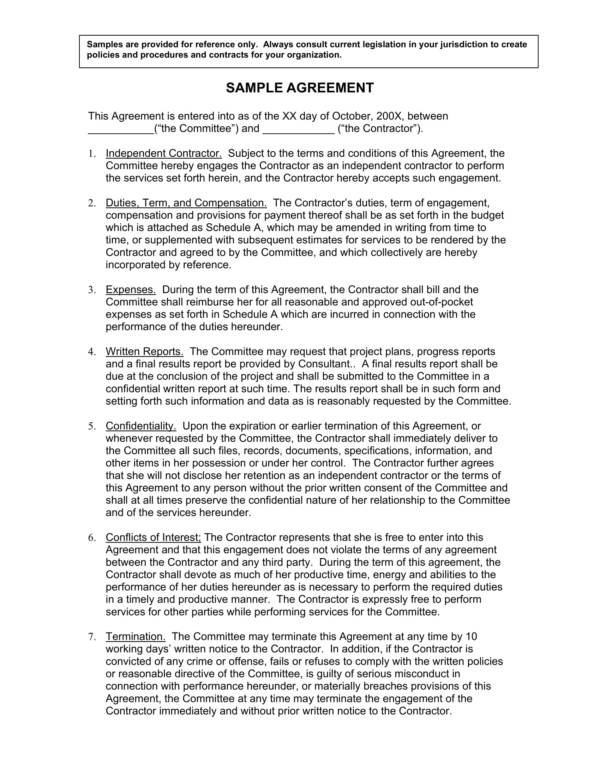 A number of agreements exist and are used for different specific purposes, like a compensation agreement. This article will be about compensation agreements. 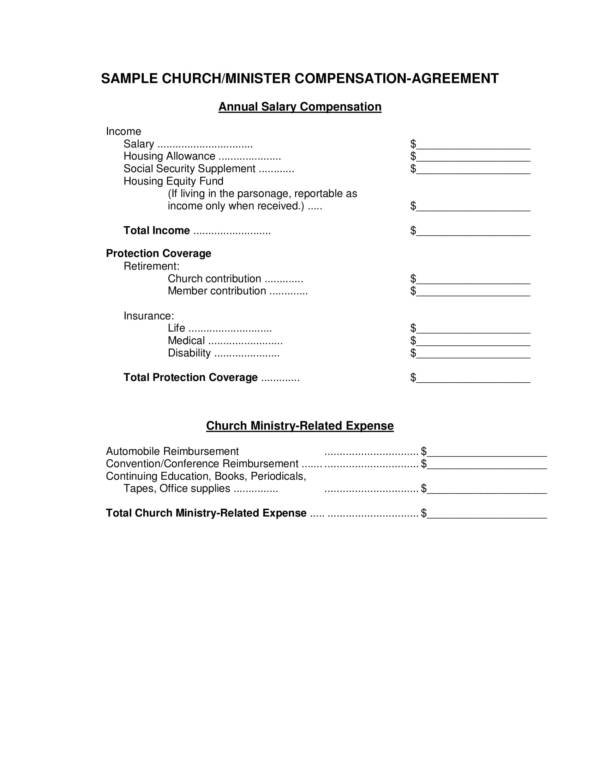 For your reference, we have included compensation agreement templates that you can download and use for your personal needs. Feel free to check them out below. Why do you need a job and why do you go to work? There is only one thing that immediately pops out of your mind the very first time you are asked this question. It’snot very complicated, isn’t it? Well, the number one reason why you need a job and why you go to work is because you get paid for it. If you get paid then you have money. If you have money, then you can provide for your family or buy your own needs, and these are secondary reasons why you need a job and go to work. You may not want to admit it, but money is one of the motivations why people want to work and need to work. The services that one offers is equivalent to a specific amount of money that has been discussed and agreed upon by an individual and their employer. 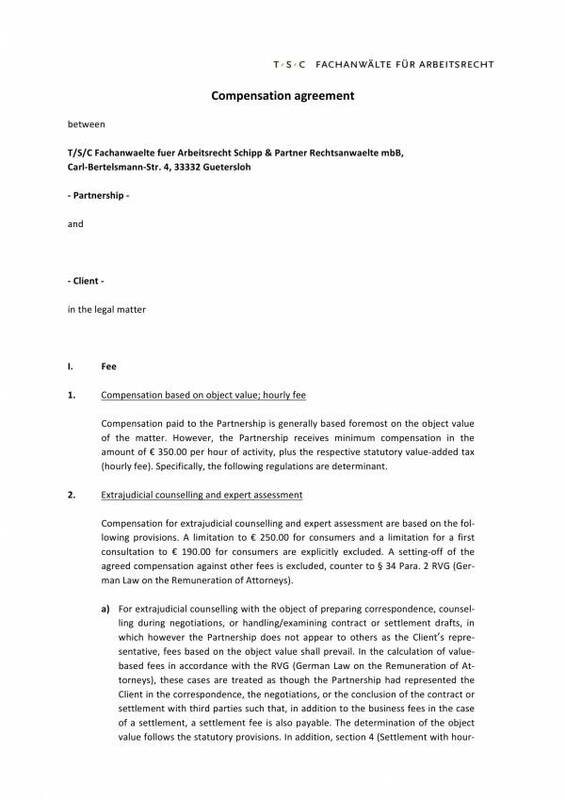 This agreement is what we know of as a compensation agreement. 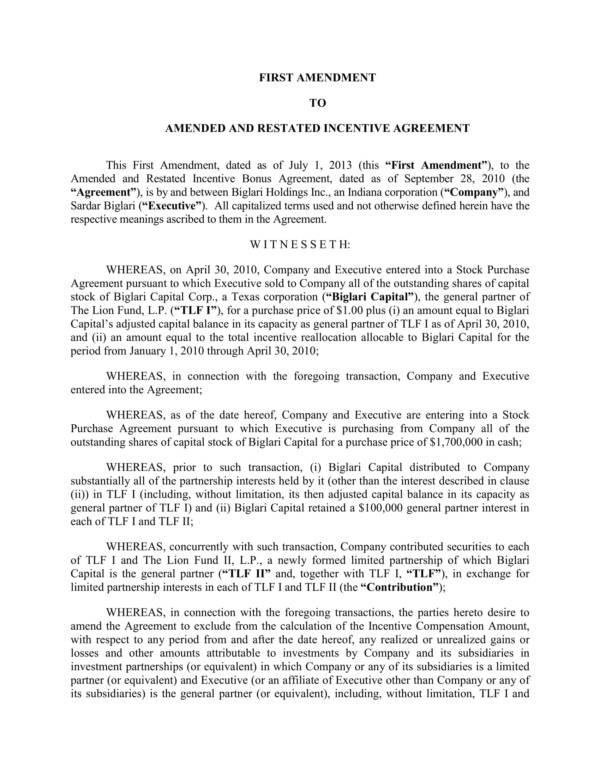 This agreement is often a part of an employment contract for employees who are going to be hired full time in a company, or it can be on its own for contractual work or job orders. A compensation must be in place before an employee or worker actually starts working. They first must know of the nature of their job they are going to do and how much they will be paid for it. In most cases, like in companies or large corporations, the compensation and benefits stated in an agreement is final and should be accepted, otherwise they will need to turn down the offer. 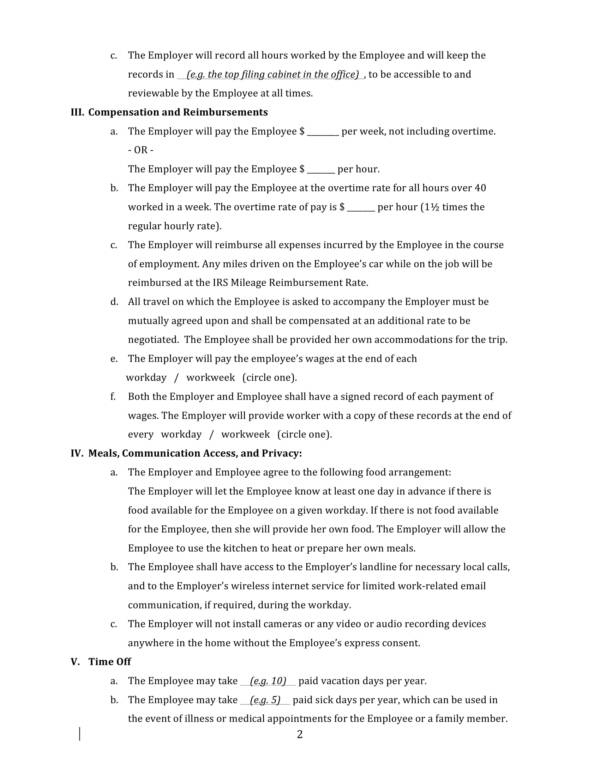 Final decisions made regarding a compensation agreement depends on the situation, the demands of the employee or worker, and the hiring party or employer. Other useful and related articles that you may browse through are Lease Agreements in PDF, HR Agreements Samples & Templates, and Investment Agreements Samples & Templates. 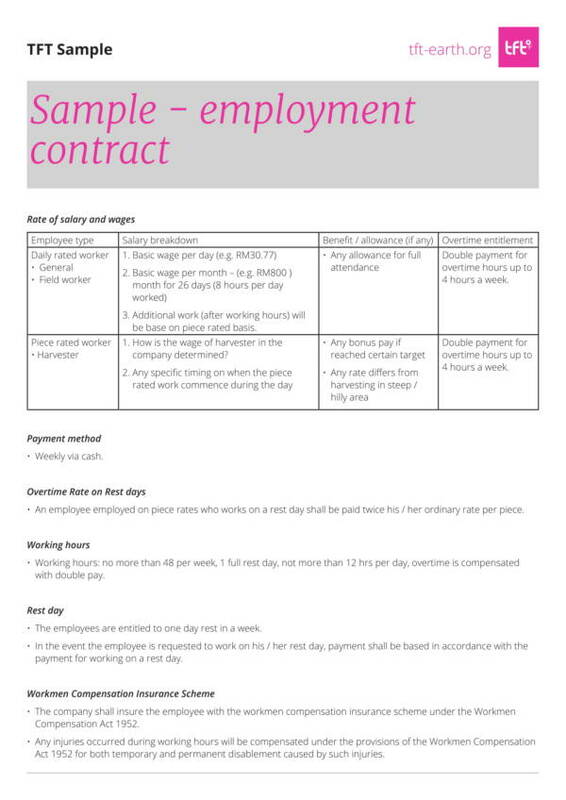 A compensation agreement template is one of those many agreement templates that exist and are commonly being used today, mainly for employment transactions and for other services where compensation is involved. Let us further take a look at the other uses of a compensation agreement template and compensation agreements in general. 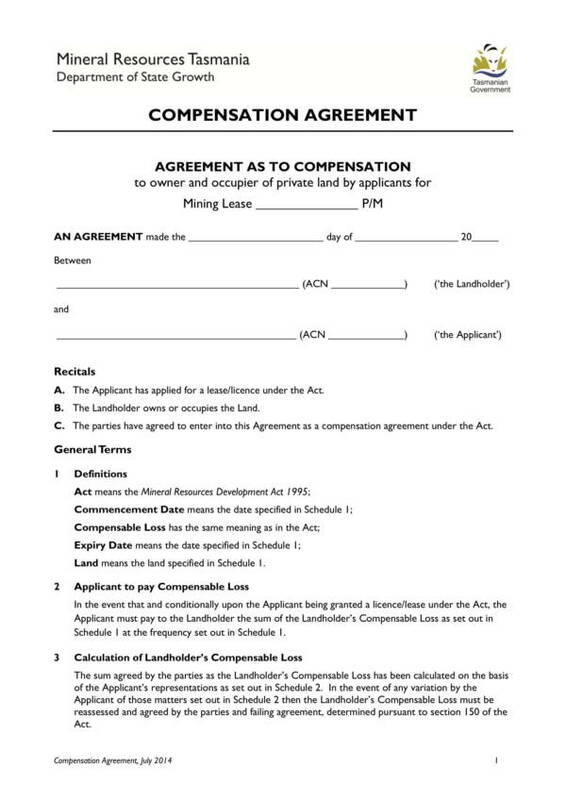 A compensation agreement template is used as a final document where the list of items that the involved parties have discussed and agreed on are recorded. It is considered as a final document because once it is signed, the agreement becomes official and both parties must do their part in making it happen. The complete details of the agreement are included in the template which makes it the best document to use as reference when issues with compensation and benefits arise, and when there are also discrepancies with the payments or compensation. Compensation agreements are used so that what has been discussed and what has been documented about one’s compensation can be made acceptable and legal. Compensation agreements are put in place so that there will be proof that the transaction actually took place. It is a document that can be used as a court evidence. Signed compensation agreements ensures that both parties oblige to every term and condition stated in their agreement. It is also created in a way that who ever makes any violation will be held liable for their actions. You can also find the remedies to any agreement violation in the compensation agreement template or document itself. These items should be included in order for the agreement to be deemed reliable, useful and effective. These are the things that a compensation agreement template and compensation agreements are used on. There sure are many more uses of this important document and template. For more references and sample, you may check out titles, like Dealership Agreement Templates, Service Agreement Templates and Samples, and Separation Agreement Templates. What Are the Two Types of Agreements? There are mainly two types of agreements and they are verbal agreements and written agreements. Both types of agreements are acceptable and are still being used today. Let us take a closer look at them. As its name implies, verbal agreements are those agreements that are spoken or discussed, instead of written or recorded. Verbal agreements could be about a commitment or a date with someone in the movies or hanging out with friends. Or it could be more serious things, like a promise to pay for rent or debt in a couple of days. Verbal agreements is a verbal or spoken arrangement where two or more parties agreed to. Verbal agreements are commonly used in friendly transactions and promises. They are also used in transactions that involve business and sales, although it is not the way these people do business. This is because transactions that are agreed verbally doesn’t leave any party with proof or evidence that the agreement did exist. So this means that there was really no agreement unless a different kind of proof or evidence is produced. Written agreements are those agreements with a corresponding document where all of the details of your transaction is listed complete with all of the provisions. Contrary to verbal agreements, a written agreement is more preferred when conducting business and doing sales transaction. This is because a document is produced and signed, which makes a solid proof or evidence that the transaction did take place. The provision of a written agreement document when transacting with another is also seen as something that a descent individual would do and gives the impression that they are doing transactions according to the law. This is very important when conducting business as it allows one to gain the trust of another, which then establishes a business relationship based on trust. How about you? Which type of agreement do you prefer most? Both types of agreement have their own advantages. Verbal agreements are easy to come up with, while written agreements provide solid evidence or proof. Regardless of what your preferences are, it is still important to choose the type that is appropriate for your transaction. You may also be interested in other related articles, like Sample Commercial Loan Agreement Templates and Real Estate Consulting Agreement Templates. 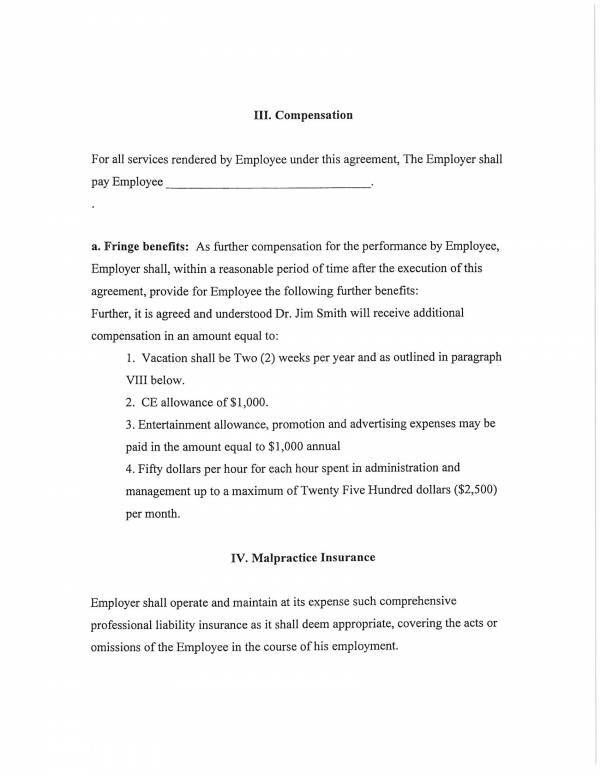 What Are Included in a Compensation Agreement? Compensation agreements does not only discuss about one’s compensation and how they are compensated, it also includes other perks and benefits that employees are entitled. These benefits are bonuses, commission plans, draws, and perks and special arrangements. Bonuses – Employers or companies that offer bonuses, include details about it in their compensation agreement. It is best to have details and criteria of the bonus to be written rather than have it as empty promises which may or may not be given to the employee. The statement includes how much of the compensation is for the bonus as well as how the bonus is gained or acquired by the employee. 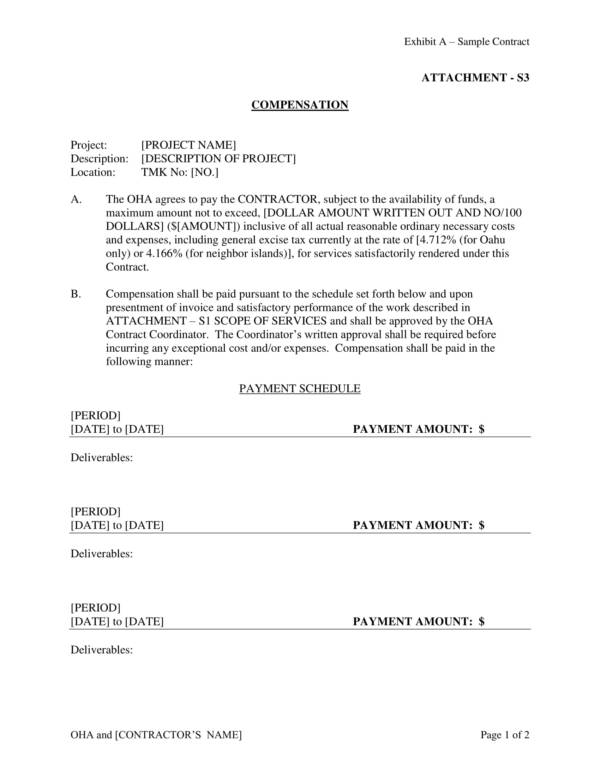 Commission Plans – How commission is acquired and computed in one’s compensation might get things really confusing. Although this only applies to commission based jobs, it is important that a thorough explanation is provided in a compensation agreement. This includes the commission rate and when the criteria will change. Draws – Still on commission based compensations, the terms on which an employee can take a draw on their commission should also be clearly stated in the agreement. Details about the repayment schedule and maximum amount of the commission should also be covered. Perks And Special Arrangements – Perks and special arrangements are either in monetary or non-monetary. Companies who offer perks and other special arrangements to their employees need to have this in writing to prevent situations where there is varying interpretations of the agreement and cases of selective memory. Examples of the non-monetary perks offered by some companies are company stocks, paid time off, company car or all expense paid vacation. The nature of your job and as well as the industry your company is operating under determines the things that should be included in your compensation agreement. There could be more compared to what has been listed above. You may also check out articles with useful samples and templates, like Commercial Security Agreement Templates and Business Development Agreement Templates. Is a Compensation Agreement Legally Binding? When can you say that a compensation agreement is legally binding? Agreements are binding, but there are certain instances that determine when it is legally binding. Before a compensation agreement binds an employer and their employee, they first need to explain all of the details of the agreement to employee, until the employee understands all of it. If the employee accepts the terms and conditions of the agreement and does not have any complaints about it, they then sign the agreement. Once both parties had signed the compensation agreement, this is when they are bound to it. The agreement is then registered and sealed for to be legalized only then is it considered legally binding. A compensation agreement that is legally binding, not only binds the employee and employer to it, it also holds them liable of their actions. This means that they must do their share of responsibilities in the agreement. The employee providing the services required of them and the employer making the agreed upon payments. Also, since the agreement is legal, it is enforceable in the court of laws. This means that any nonperforming or violating party can be sued and brought to court. What Happens When an Agreement Is Breached? A breach in the agreement takes place when any of the provisions or terms and conditions of an agreement is violated or not followed. Every agreement states the instances or situations considered as a violation or breach together with the corresponding remedies to those violations or breaches. So what when an agreement is breached, it is first arranged among the two parties that are done in the presence of their legal advisors or lawyers, where they discuss about the acceptable remedies to the violations done. If the arranged discussion goes smoothly, then things are settled. But if both parties does not come into agreement with any of the remedies provided, then the case will be brought to court. In most cases, breaches are resolved with the remedies presented by both parties. This could also be because bringing it court could end up really troublesome and may take quite some time to get resolved. Interested to learn more about agreements? Why not check out articles, like Employment Termination Agreement Templates and Software Development Agreement Templates.